A container from DC-Supply A / S is the ideal solution when the problem is space shortage – and this applies to shorter or longer periods, or even a permanent solution. If you also choose an insulated warehouse container, you are guaranteed that your goods are stored dry and safe. It is therefore very suitable for storing moisture and temperature sensitive goods. 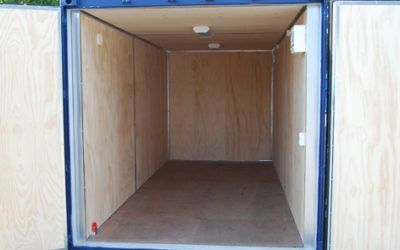 A storage container can be customised according to your unique needs – for example, it can be delivered with custom-made shelf systems, fan, heat or both interior and exterior light. If you also rent or purchase one of our insurance-approved locking brackets, the container is easy to secure. We build custom-designed warehouse containers in sizes of 10 foot, 20 foot or 40 foot ISO containers. Common to all sizes is that they are practical, easy to move and can be serialized with other containers as needed. If you have questions about storing goods, or if you do not have experienced guidance in relation to a specific issue regarding storage, please feel free to contact one of our experts. At DC-Supply A / S we offer solutions for both sale and rent, and together we find the constellation that constitutes the optimal and most cost-effective model for you.